﻿﻿She turned to the teleprompter, looked out into the sea of men in the audience. Each of us held a large childhood picture in our arms. “It’s hard to see all of your pictures,” she told us as she wiped the tears from her eyes. For the next three hours I grieved amongst a group of 200 men who were all survivors of child abuse. Some at the hands of strangers, most by adults we knew and trusted. Most of the men here today, and Oprah, were abused by more than one adult. Some were abused by other children, and some went on to be abused into adulthood. Many of our abusers lived complete lives, free from incarceration. Free from having to answer for their horrific acts. They live in your communities. When I wasn’t crying I was trying to stay present, in this moment. But I often did what I do whenever my trauma approaches. I disassociate. I felt myself watching the studio of men from a safe distance even as I was sitting in the middle of it. Oprah began the discussion with Tyler Perry, a film producer who recently disclosed his personal history of abuse. I could see this audience of 200 men collectively unhinge itself. I saw men all around me crying and exhibiting incredibly pained expressions of grief. I felt like I was at a funeral for a close friend. I saw old men crying inconsolably, just like the little boys who died in their hearts. There was a man sitting across from me. His face was bunched up so tightly and he hunched over again and again sobbing. All I wanted to do was walk across this studio and give this boy some reassurance. Eddie had a beautiful daughter of his own. She was just a child when he passed. Now we are both the caretakers of his memory. I will never have the priviledge of having his quick wit and infectious laughter fill up my soul with life. We were once just two abused kids, just trying to make it through. Now he is gone and I am here. The studio was filled with lights and cameras. The film crews shuffled around, doing many things all at the same time. Oprah was the calming presence in the middle of it. She looked us in the eye and in her eyes I could see an underlying message to all of us men. Just stay with me a little longer. I struggled to keep my eyes open. The exhaustion was so great my body was shutting down. Twin brothers, about my age, got up from the front row and joined Oprah in the center. They began to disclose the story of their abuse. Molested by priests for 13 years. I felt this anger and rage fill my body, every hair rising up. I looked around at the other men in the audience and saw a reflection of outrage. These boys told their mother, but they weren’t believed. So the abuse continued. I looked up, from time to time, at the cameras around me. One camera stood directly at me for the entire taping. I wondered if my face would be broadcast. I wondered about all the people in my life who didn’t know. Imagine the shock if you just turned the channel on the Oprah Show one day and saw your son, brother, nephew, friend, or uncle sitting in that audience. Would you mourn for him? Would you wonder who his abuser was? Would you believe him? Would you reach out to him and offer support? What if you were his abuser? Towards the end Oprah opened it up to questions. My body became a tangle of pins and needles. I had something to say. We all had something to say. I saw a man in his 50’s stand up to speak and wondered how many decades he had waited to finally say something here. There would never be a moment like this again for any of us. We filmed two shows that day and were only barely scratching the surface of all that went on. I think Oprah saw this so she let us speak. The Q&A session was never aired. I’m not sure that it mattered. Before I knew it I was in a bus heading to the airport. There were so many guys I wanted to say goodbye to but never got the chance. But I had nothing left to muster. So I buried my head into a pillow on the flight back. From flying to Chicago, filming two episodes of The Oprah Show, and flying back to Seattle, it had all happened in less than 48 hours. Even now, i’m still recovering from that short and great impact on my life. One thing I realized is that when we hold secrets we hold back a piece of ourselves. We deprive our friends, family, and spouses from the true joy in our hearts. They can never know our stories unless we tell it. So many men and women went to their graves having never told anyone. So I think of all the people in the past who weren’t given the opportunity to grieve. I think of my abuser. I am not sure what happened to him. I don’t think he will ever tell us. I know what he took away from me. There were men his age in that audience. These men were born from a generation even further entrenched in the silence. Their presence brought me hope. I do believe that men who tell are the exception, not the rule. That is what made this Oprah special a very unique experience. We have always been told that boys don’t cry. Yet they always do. These men stood together, in front of millions, despite our society. These men stood with a powerful female advocate. I am not sure of the long term impact of these shows, but what I do know is the extraordinary effect the show had on the lives of the men. We are telling our family and friends for the first time. We are confronting our abusers. We have started campaigns to combat abuse. We are going into therapy. We are telling our stories. 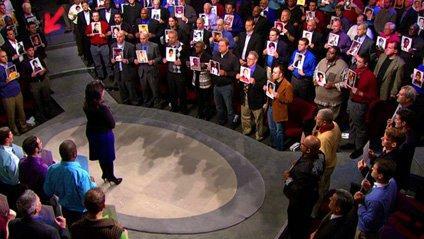 200 of Oprah’s Men. I am proud to call myself one of them. They say that one motivated soul can affect change on an entire society. Imagine what 200 can do. Imagine if we all finally woke up and began to really talk for the first time.